The Poinsettia is synonymous with Christmas, they are widely used in Christmas decorations and displays due to their luscious red and green foliage. Here we have a ThreadABead brooch design that will always stay vibrant and festive. Whether you wear it for your Christmas party or to jazz up an everyday outfit. 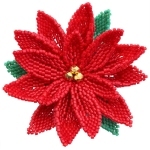 The brooch comprises of 18 petals in red and green with just a few little gold beads for the centre of the flower. This also makes a great present for female relatives at Christmas! As usual with ThreadABead featured patterns we give full detailed photographic instructions and in this pattern there are 44 detailed steps, making this pattern even suitable for beginners to beading. This pattern is made using Japanese Miyuki size 11 Delica beads and Brick Stitch is used. It is assumed the beader will be familiar with Brick Stitch, however full instructions are inclued. Please note the pattern may not work with any other size and type of beads. There is 2 delica colours in total and the finished beadwork is approximately 6.5cm x 6.5cm. 1 x 2-Hole 20mm Brooch Finding and 4 x 4mm Gold Plated Firepolished beads are also required. The bead pattern supplied is 19 pages and includes a colour chart of suggested delicas, and 44 step by step colour photo instructions.